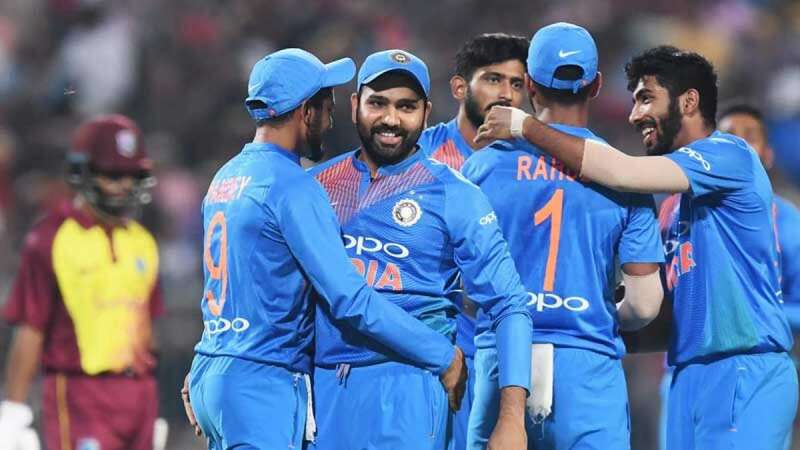 Kolkata : India pipped a fighting West Indies by five wickets riding on chinaman bowler Kuldeep Yadav's venomous stuff backed up by some responsible middle order batting display after early hiccups in the first of the three T20 Internationals here on Sunday. The Indians lost early wickets, but Dinesh Karthik (31 not out; 34 b, 3x4, 1x6), Pandya (21 not out; 9b, 3x4) saw the home side through with 13 balls to spare in the low scoring tie. Debutant pacer Oshane Thomas (2/21) sent down a delectable stuff and took Sharma's inside edge. Dinesh Ramdin took the diving catch to his left behind the stumps, much to the dismay of the 40 thousand plus spectators, who had hoped to see another cracker of a knock from the Mumbaikar on his favourite ground. K. L. Rahul (16; 22b, 2x4)also returned to the hut in Brathwaite's next over. The Indian batsman perfectly executed a pull shot, but was devastated to find it finish in the hand of Bravo again at deep square leg. But just when it seemed India were on course to wrapping up the game, left arm spinner Khari Pierre got rid of Pandey (19; 24b, 2x4) with a caught and bowled effort. However, Karthik: and Krunal Pandya (19 not out) took charge at the that stage. Pandya played a cameo, and the duo steered the side to victory in 17.5overs. The Windies were reduced to 34/3 in seven overs when Pandya -- who had misfielded in only the second ball of the innings -- was brought in. Newcomer Fabien Allen top-scored for the Windies with a counter-attacking 27 off 20 balls (4x4) while Keemo Paul remained unbeaten on 15 along with Khari Pierre (9 not out).